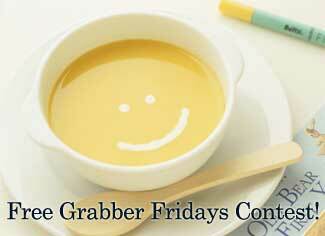 Free Grabber Fridays Contest! Winners!!! Good Morning. Thanks for everyone that participated. Odds were pretty good (71 comments, 2 winners). Contest Winners are: savergirl picked T.J. Maxx Gift Card and dragonlady picked Lancome.com E-certificate. Full size bottles of Pantene shampoo and conditioner!!!!!! I was soooo surprised to receive these to review for the company!!!!! I’m a member of BzzAgent, where you sign up to sample and “buzz” new products and the coolest one I got was free Listerine Whitening Strips. The send you full size products and then extras to pass out to friends. The most useful is definitely the sawzall blade from Milwaukee. I used it to cut out some floating cabinets in my kitchen and other parts of cabinets to put in a microwave over our range. Cuts more smooth than the blade that came with the saw. Nice!! All of the freebies I receive are useful, but diapers & T-shirts are the best!!! The most useful freebie I have received has to be the coffee samples. I do not drink coffee myself, and I hate to buy it for company because it always goes bad in between guests. The samples are the perfect size and I do not feel so wasteful! Mine have been the utility knife blades from Irwin. I am still using them. they sent me a pack of five. diapers are great, and of course coffee! Doggie treats are good for my Lexi and Tank. They love freegrabber! The most useful freebies I have gotten were the batteries from Energizer and coupons for free dog and cat food from Purinaone…. Every sample I receive is very useful but I really enjoy the food,tea,and coffee samples the most.Thanks Free Grabber :-)! Cream, hand sanitizer, deodorant, shampoo. Anything in a small bottle because I take then on trips and the airlines allow those sizes. Baby formula freebies are the best! The most useful freebies are t-shirts and coffee!!! The most useful things i received on freegrabber was any hair products because I love to try out new ones before I buy them, and a Pur water bottle which I bring to work every day 🙂 Thanks! The most useful freebie I ever got was a diaper sample from huggies. I had run out and not even noticed til it was TOO LATE (it was a nightmare!) but I looked in my mailbox and there was a shiny brand new diaper just in time to save the day! Yay freebies!!! Laundry soap and tea have to be the most useful. As a mother of three always have laundry to do and after they are all in bed who couldn’t use a nice relaxing cup of tea. Baby formula! Formula is $25+ per can and my daughter goes through about a can every five days. Enfamil has sent me several cans of formula, great coupons (up to $10 off) and a diaper bag. Definitely the most useful samples I’ve received. I have not received an email yet!